Ask us for food combinations that make 100% sense, and we’ll reel of combos like burgers and fries, bacon and eggs and yogurt with fries. Some may seem a bit beyond the norm, but once you try them, you appreciate the taste and general greatness. For example, one might scratch their head at the idea of putting peanut butter and jelly together, or meat and fruit, or even waffles together with fried chicken. Others though, we truly think were thought up by a complete lunatic. Just thinking about these combinations makes us scratch our heads in question; how were they even discovered? Who would think it is okay to try them? Why were they even invented in the first place? And in the name all that is good- why are they so popular? It goes against every sense and logic that pasts and ketchup be allowed to even come into contact; or the combination of marshmallows and a hot dog, or even more disgusting, soy sauce on ice cream. This is real life though, and these combinations do exist- because there is little logic or sense in the world. Bustle actually claims that chocolate acting as a dip for pickles is not such a new concept. We are still unsure what ancient tradition introduced this disgusting practice, but we do know whoever did could have had some sense talked into them at the time. 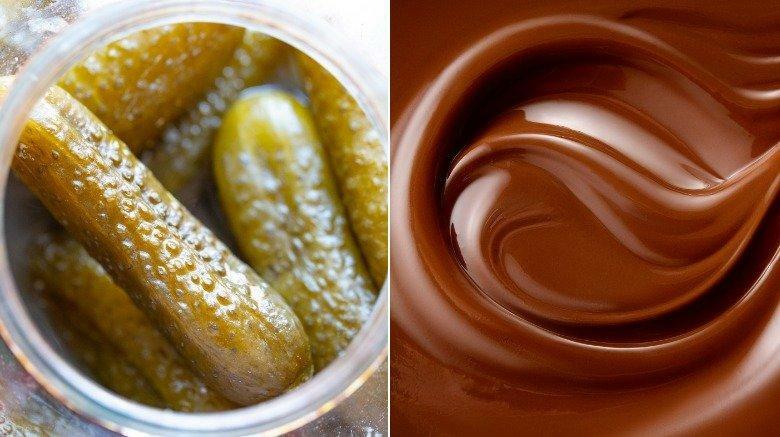 Delish writer, Lena Abrahams, actually popularised the trend of chocolate-covered pickles in 2017 when she wrote a piece on the internet about the combo. Since that time, people have actually given the weird food a try in large numbers. As to be expected, people have really diverse opinions on whether or not the combination actually tastes good, or if it’s a large fail (guess which opinion we have). Some people have lauded the mixture; saying that the pickles’ saltiness and chocolate sweetness is a good mix, while other people have equally praised the flavors, saying they complement each other well. Smarter critics, have, however, disregarded all claims of a mouth-watering delicacy, and snubbed the weird mouth feel of the combo. Try for yourself, and see how it tastes to you. Or, you could take our word for it, and don’t. This second food combination is so wrong; the Italians are seeing it as an insult. A 2013 interview with The Local had the president of an Italian food organization, Gianluigi Zenti, expressing his displeasure with the combination; saying it was actually one of the most popular weird foods visitors and foreigners request for. “When people ask, ‘Where can I get pasta and ketchup?’ we are horrified,” he told the site. “It has nothing to do with Italian cuisine.” The dish is actually something of a food celebrity, making headlines when Trump appointee, Brett Kavanaugh, was revealed to eat his own pasta with helpings of ketchup on top. It is actually a feat for us to imagine what exactly people enjoy by ruining a perfectly fine plate of pasta with ketchup. Maybe they enjoy the sweetness of the ketchup, or the mix of textures is something of a genius move to them? Or, maybe they are just unaware of the existence of pasta sauce. Whatever people say is the reason behind their madness, we really shouldn’t be surprised the Italians are offended by this. This one is especially offensive because so many awesome things already go so well with fries, or ice cream. 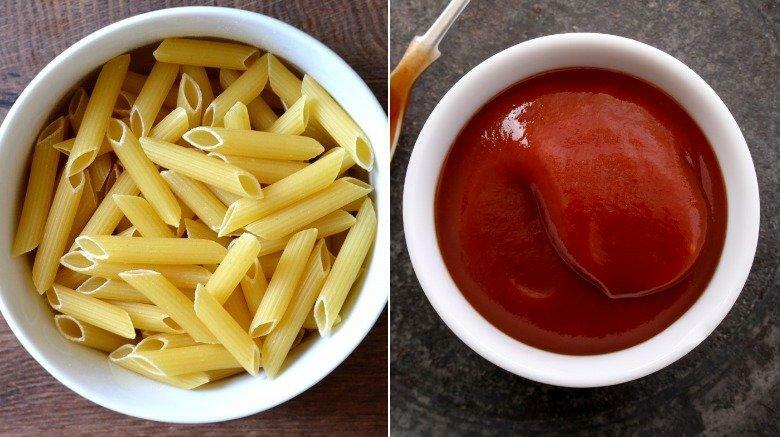 If you have any left over from your pasta, you can eat your fries with some ketchup. Of course, mustard and mayo are also perfectly acceptable alternatives. There is also an assortment of choices in sauces and condiments; BBQ sauce, chili sauce, salt and vinegar, melted cheese, garlic mayo, sour cream and gravy. Everything works perfectly with fries. Still, people still choose to accompany their fries with melted ice cream. Yes, that is exactly as it sounds. 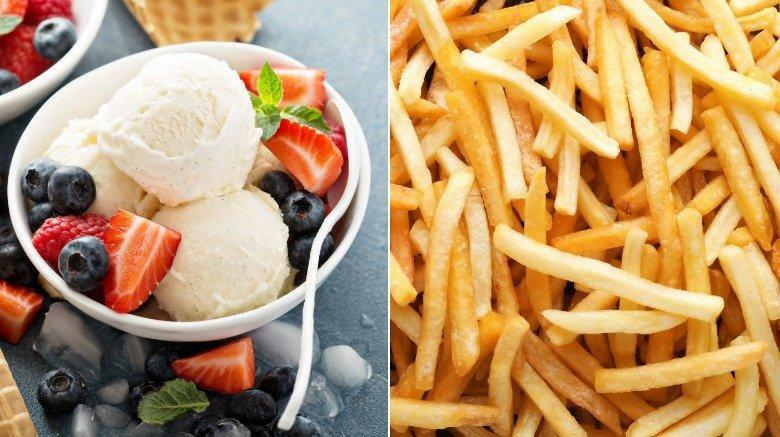 You take some perfectly good fries and ice cream (slightly melted), and put them together to form something else (fries cream?). Fans of Wendy’s have helped in popularising the combo by constantly requesting fries dipped in a Frosty. Needless to say, everything about this is contrast. The sweet meets the salty; the hard hits the soft, and the hot meets cold. It is almost a war area in your mouth, with the two foods in a battle for the supreme reign. Maybe that is what has people so enamoured. The unfortunate portmanteau is enough grounds for an argument on how much of a fail this food combination is. 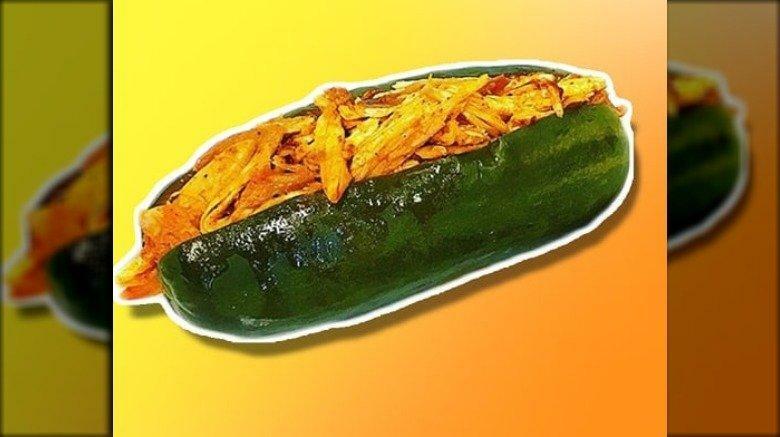 A Chickle is the crafty name for a pickle stuffed with hot chicken. And, we all have The Fresno Grizzlies, a minor league baseball team to thank for this, as they are the ones who came up with the Chickle for a match against the Nashville Sounds in 2017. Unfortunately –or fortunately- for fans of this food, the chickle was only made available for two days when the teams played against each other. Despite all these, the Chickle actually turned out to be something of a celebrated creation, making headlines with mixed reviews all over the world. Metro called it “deeply unsettling.” Mashable left their review on the fence, referring to it as “either genius or disgusting.” WideOpenEats described it as “everything you could want from chicken inside a pickle. And even though the Chickle is not quite up to the heights that hamburgers and pizzas have gotten to, we can say that it is worthy of some applause as an act of innovation from the Grizzlies. However, they can hold off on the innovations from now. You were expecting this next one, weren’t you? It is kind of inevitable to not mention avocados and lattes in the trendy world. So, it is little surprise that the two eventually came to exist as one. We introduce you to the Avolatte (more clever portmanteaus), basically a latte dished in a shell of avocado. It was actually created as a joke but then, as these things tend to do, began to take off and gain popularity; and now, is even something of a phenomenon. We mostly have social media hype to thank for the widespread recipe. 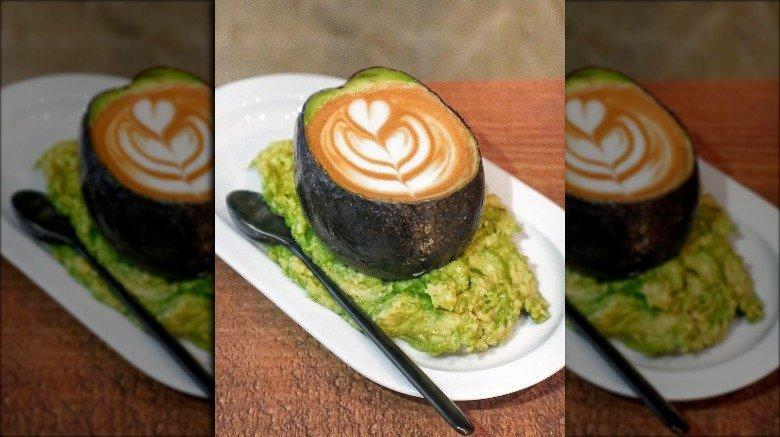 According to the original café’s manager, he explains that the Avolatte is a “fun way of rebelling against the older generation who says we won’t own a house because we spend too much money on avocado and coffee.” Well, there you go. This is the symbol of the 21st century youth revolution and it is made in coffee shops and served in empty fruit shells. Classic. Burgers are arguably one of the most versatile foods out there; they can serve as a vehicle for an almost inexhaustible number of toppings, from the creative to the absurd. These days, order a burger holding nothing but the regular onions, lettuce and cheese, and you’d b thought boring. Burgers call for creativity, open your mind and top them with mushrooms, pickles, peppers, jalapenos, bacon, coleslaw, guacamole, a wide selection of cheeses, sauces, fruit and vegetables to your burger. Whatever suits your fancy. 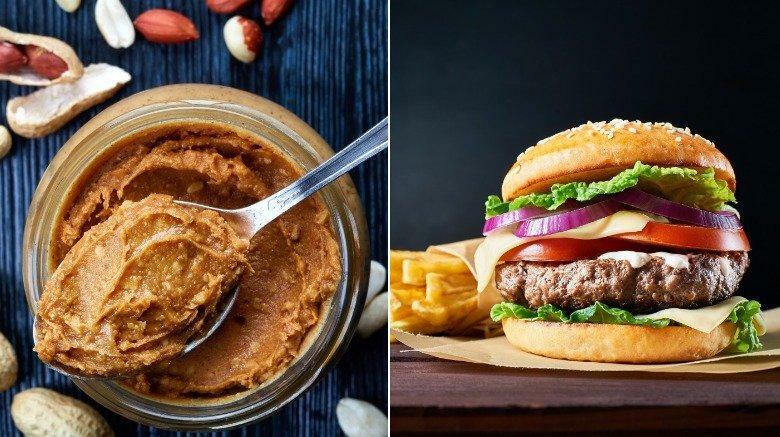 We were fine with all that until some genius hamburger joint decided to take things one step further and include peanut butter to the list of available toppings. Killer Burger, a burger joint, is popular for this recipe. The joint’s burger holds a beef patty, pickles, and the icing on the cake; a slathering of peanut butter. The peanut butter is supposedly said to act as a substitute to cheese; except for the obvious differences in taste. Reviews have claimed that Killer Burger’s peanut butter burger is “an insane experience”. We definitely don’t find that too hard to believe. Ivanka Trump stunned the internet and the world back in 2017 when she posted some pictures online of her daughter’s sixth birthday, and one of the images showed a platter of skewered hot dogs and marshmallows. The internet did not disappoint in their reactions of disgust and confusion. The snack should not have come as too much of a surprise, though. 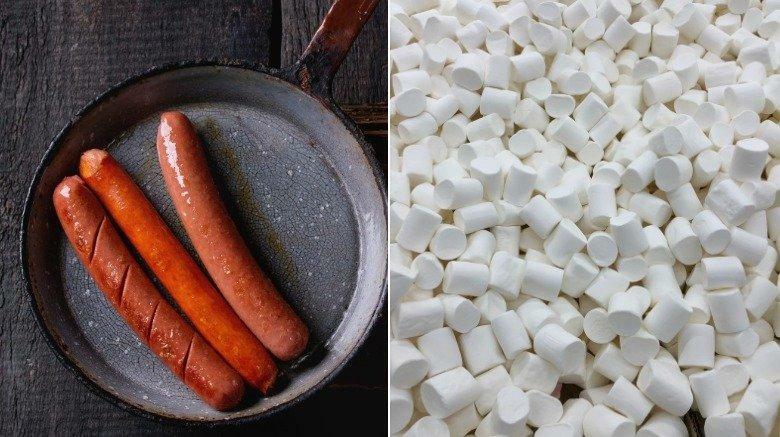 After the photos went viral, investigations revealed that hot dogs and marshmallows are actually pretty common at kid’s birthday parties in the Philippines. The popularity is mostly as a result of its affordability and kids’ fondness for it, while the country’s youth took it as a minor delicacy. The investigation also showed that marshmallows and hot dogs usually go hand in hand with fried chicken and spaghetti. The pictures Trump shared also included spaghetti dishes from her daughter’s party. It really leaves us wondering why the Trumps have chosen to adopt this tradition. Yup, you read that right. The strangest part perhaps is that a lot of these strange food combos actually originate from pretty well-meaning sources. It could be a local burger joint, an adventurous coffee shop, or even a baseball team. But, would you believe that some of these truly disgusting meals actually come from top rated, haute cuisine restaurants? 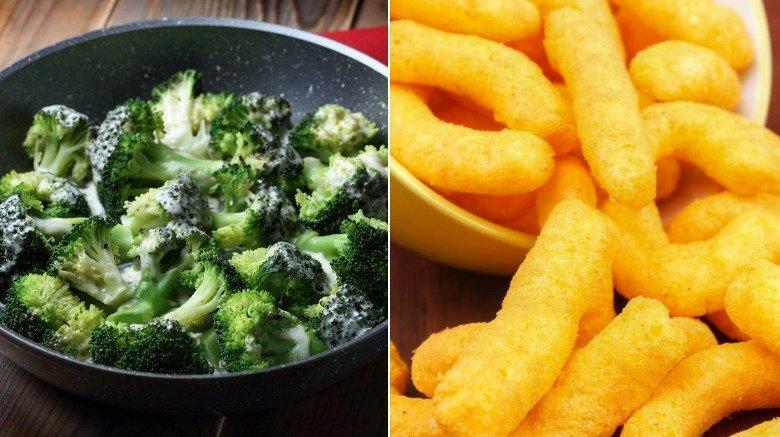 Broccoli with Cheetos is actually a recipe that was created by Chef Craig Koketsu, in 2014 at New York’s Park Avenue Winter. The Cheetos are added as a garnish to the broccoli, and the dish is served with Parmesan sauce and Gouda. We definitely are not too certain about how well the dish fares in terms of popularity among the fine dining Park Avenue diners, but we can guess that a majority of them would not want to spend their money on a simple, boring dish. Added to that, some ill-advised person released the recipe to the public, so now; everyone can make Broccoli and Cheetos. Although, who would? This one might not be too much of a new innovation but doesn’t make it any less disgusting. Sora News 24 traced the practice of spooning down ice cream and soy sauce back to the northern island of Hokkaido in Japan. And it is basically as easy to make and eat as it sounds: some ice cream and seaweed are mixed together, and then soy sauce drizzled on top. The argument would be that soy sauce is equivalent to caramel and salted vanilla in terms of flavor. Then, the seaweed is said to lend a crisp texture, serving as a nice contrast to the smooth texture of ice cream. 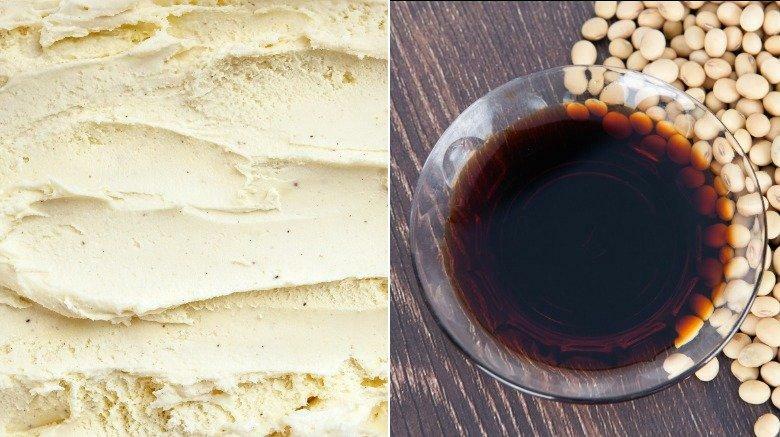 Though the popularity of ice cream and soy sauce is actually questionable, as some Hokkaido originals claim to have never even heard of it, there is still a beacon of hop – Japanese company released soy flavored ice cream in 2012. Good news, right? If you are looking for existing proof that even tough an idea seems without complications does not make it good. The Pickleback is basically a back of pickle juice and a shot of whiskey. Not mixed together but, you first drink your whiskey shot, and then you throw back the brine. 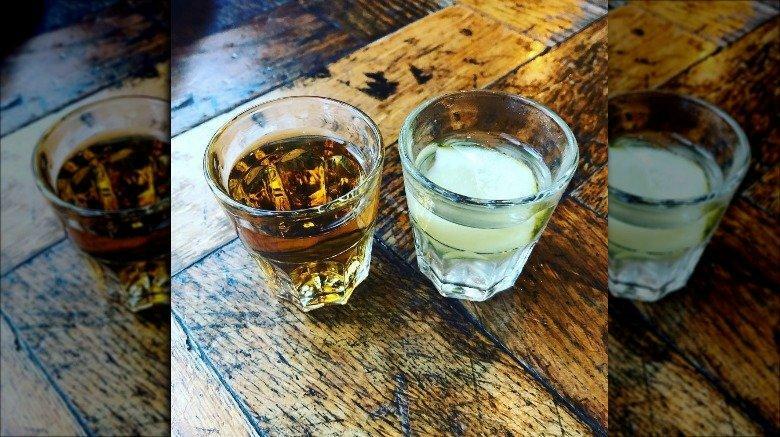 Even more shocking than the original creation of this combination is the fact that the Pickleback is now gaining huge popularity in the United States, and is making an appearance on bar menus. The culprit in question to blame for the creation of this disaster is the Bushwick Country Club in Brooklyn. The drink gained popularity on St. Patrick’s Day, and of course, the internet pitched in and kindled the embers of popularity. Kitchn’s review of the Pickleback states that the combination cannot be called downright terrible, and it does hold appealing elements of saltiness, sourness, booze and other flavours, even though it immediately makes the poor victim hungry. Maybe you can try one next time you see the Pickleback on a bar menu. Or not.